Let's follow where the chickens go. Each has equal probabilities of getting into any of the four boxes. Some configurations are OK, some violate the constraints of the problem. Why there are two solutions and which is correct, as the two can't be correct at the same time. The difference between the two is in that the first one treats the chickens as indistinguishable the second presumes that they are different: chicken #1 and chicken #2. 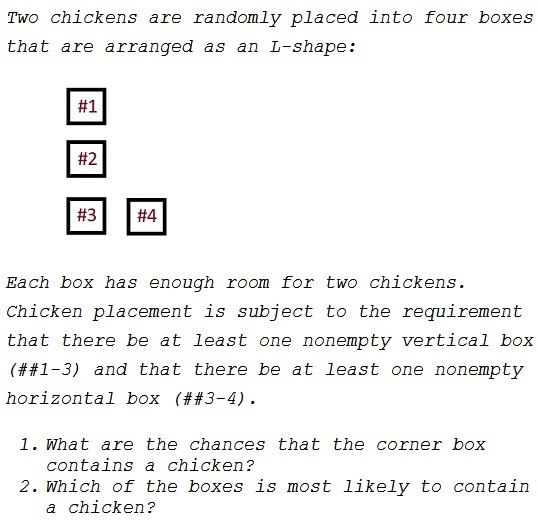 I do not believe that the problem is suggestive of the idea of two different chickens, although Solution 2 has been posted several times. I included it here to give a reason to remark on that topic. This is a modification of a problem from P. J. Nahin's Will You Be Alive 10 Years from Now? (Princeton University Press, 2014). The two solutions above give different answers. Which is right?